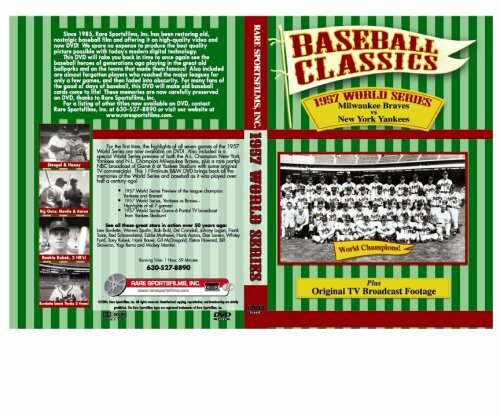 Now for the first time ever, a full 1 hour, 59 minute DVD is available containing all the highlights of every game of the 1957 World Series, plus a World Series preview of both the American League champion New York Yankees and National League champion Milwaukee Braves, as well as most of the actual NBC TV broadcast of Game 6 of the series from Yankee Stadium, New York! First you'll see a special World Series Preview - a rundown of each player on both teams before the series begins! Shown are some of baseball’s greatest players of the 1950’s including Hank Aaron, Eddie Mathews, Red Schoendienst, Warren Spahn, Lew Burdette, Joe Adcock, Whitey Ford, Bob Turley, Elston Howard, Bill Skowron, Hank Bauer, Gil McDougald, Yogi Berra and Mickey Mantle! As a bonus, we’re also including most of the first 5 1/2 innings of the original NBC TV broadcast (with some of the original TV commercials) of Game 6 from Yankee Stadium! Game 1 at Yankee Stadium: Whitey Ford vs Warren Spahn – The Yanks take the opener on the strength of Whitey Ford's 3-1 complete-game victory! The Braves score their only run in the 7th on a double by Wes Covington and a hit by Schoendienst. Game 2 at Yankee Stadium: Lew Burdette vs Bobby Schantz – The first of two great series catches by Wes Covington saves at least one run, and keeps the game tied at 2-2 at the end of three innings. In the Milwaukee 4th, Covington knocks in the Braves' go-ahead run and another tallies on rookie Kubek's error. Burdette blanks the Yanks over the last 6 innings, as Milwaukee squares the series with a 4-2 victory! Game 3 at County Stadium: Bob Turley vs Bob Buhl – Young Yankee Tony Kubek returns home to Milwaukee and smashes two homers to help New York to a 12-3 rout of the Braves! Mickey Mantle and Hank Aaron also hit homers. The Braves leave 14 men on base and both clubs set a new series record with 19 walks. It’s the longest game of the series, time-wise at 3:18. Game 4 at County Stadium: Warren Spahn vs Tom Sturdivant – This one is a classic and by far the most exciting game of the series! Warren Spahn has a 4-1 lead with the bases empty and two out in the 9th, but New York stages a typical, come from behind rally. After singles by Berra and McDougald, Elston Howard unloads a three-run homer off Spahn that ties the score, 4-4! When the Yanks score again in the 10th to lead 5-4, it appears the Braves are finished and will be behind 3 games to one in the series. However, the"Nippy Jones shoe polish" incident becomes the turning point of the series! Pinch-hitter Jones is awarded first base after being hit on the foot by a Tommy Byrne curve. Yank reliever Bob Grim then gives up a ringing double to Johnny Logan and the stadium is in an uproar as Eddie Mathews comes to bat! Mathews then smashes a game-winning homer that turns what looked like a heart-breaking loss by Warren Spahn into a great victory for the Braves and ties the series at two games apiece! Game 5 at County Stadium: Lew Burdette vs Whitey Ford – Game 5 turns out to be another classic – a classic pitching duel, that is! Burdette and Ford match each other pitch for pitch in a bristling mound duel for almost 6 innings! In the Milwaukee 6th, Joe Adcock's single drives in Eddie Mathews with the only run Burdette needs to beat the Yanks 1-0! Game 6 at Yankee Stadium: Bob Turley vs Bob Buhl – In this game, all runs scored are the result of homers! Yogi Berra gives the Yanks the lead with a two-run shot in the third inning. Homers by Frank Torre and Hank Aaron (his third of the series) tie the game 2-2, but Hank Bauer's homer off Ernie Johnson that kicks off the LF foul pole turns out to be the winning run as the Yanks tie the series with a tight 3-2 win! Game 7 at Yankee Stadium: Lew Burdette vs Don Larsen – Lew Burdette becomes a World Series hero with another brilliant shutout over the Yanks and the Braves are World Champions when they beat New York 5-0 in game 7! The Braves score 4 in the 3rd on Eddie Mathews' two-run double, a hit by Aaron and a fielder's choice. Del Crandall's HR in the 8th is merely icing on the cake for Milwaukee fans, as Braves win World Title! Rare bonus footage included: Most of the first 5½ innings of the original NBC TV broadcast of Game 6 at Yankee Stadium, narrated by Mel Allen and Al Helfer is presented as bonus footage! The game begins as a battle of fastballing righthanders, Bob Turley vs Bob Buhl. By the end of the 3rd inning, the Yanks lead 2-0 and Ernie Johnson is pitching for Milwaukee. You'll see Frank Torre's second homer of the series to bring the Braves within a run in the 5th inning.